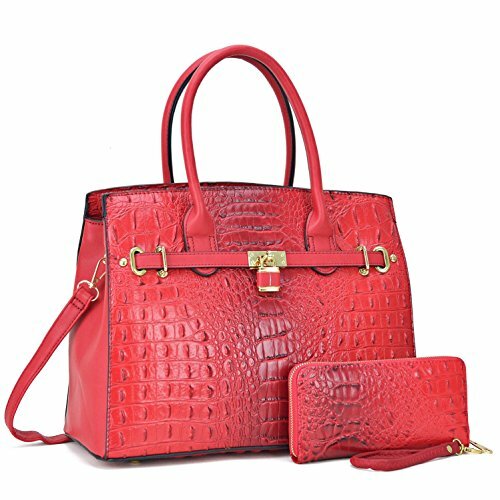 This Ostrich and croco embossed faux leather satchel, now comes with matching wallet, has sophisticated written all over it. We adore its classic shape and details, from the comfortable round handles to the sleek gold-tone pulls. with many pockets to keep your essentials organized on your busy day! LIGHTWEIGHT AND SECURE: Top Zipper Closure / Adjustable and Detachable Shoulder Strap: let you keep your bag secure around on your forearm or over the shoulder to better match your outfits. Your bag will not slip turn or move out of place while carrying our gorgeous bags.Perfect for using in office, school, dating,travel or any other daily occasions. SPACIOUS STORAGE AND MULTI POCKETS: Interior: 1 Center Zipped pouch divider / 2 Open Top Item Pockets / 1 Back Zipper Pocket ; Exterior: 1 Back Zipper Pocket ; Large capacity for holding all your essentials and varieties of colors available.